Well we have had a very wet and windy time in Far North Queensland (FNQ) so far. This time of the year is normally dry but the area has had an unseasonably hit of wet season. A few of the roads up in the cape have been closed due to flooding. But according to the authorities and locals after a few days of no rain the roads should all be ok again. So tomorrow we head into Cairns to get ourselves ready for our Cape York adventure. For any of my international readers if you look at a map of Australia, Cape York is the pointy bit on the right hand side. But for now we are in Kurrimine Beach just over an hour south of Cairns. I have been here before as my son Shane, and his partner, now wife Stacey lived here for a while. Kurrimine Beach is really a holiday location with a permanent population of around about 700. The two major towns either side of Kurrimine are Innisfail and Tully where we went for a bit of an explore today. Innisfail was originally known as Geraldton until 1910. 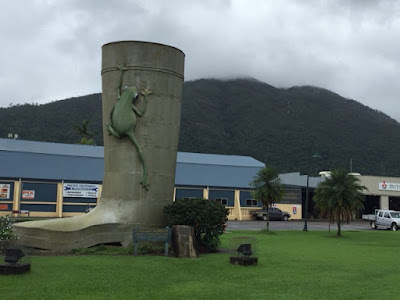 It is the major township on this Cassowary Coast Region and is well known for its sugar and banana industries although I did see a few farms growing avocados. Being an old town that was once very prosperous it has some beautiful preserved buildings. Tully is also a sugar and banana growing area. But with an average annual raining exceeding 4,000 millimetres (160 inches), and the highest ever rainfall in a populated area of Australia (7,900 millimetres / 310 inches) in 1950, Tully has the name as being the wettest town in Australia. 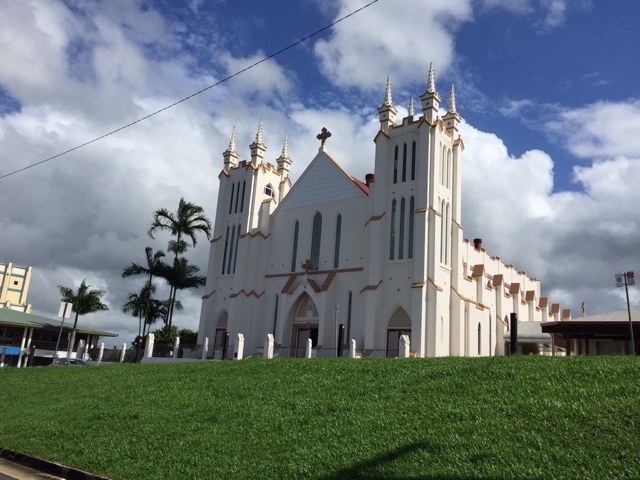 Although a rivalry exists between Tully and nearby town of Babinda for the title. In 2003 this giant gumboot (the Golden Gumboot) was erected as a monument to the towns climate.